What are the Options for Symptomatic Shoulder Instability? Shoulder instability occurs when there is excessive laxity of the shoulder joint in one or more directions due to difficulties in maintaining the head of the humerus (upper arm bone) centered within the glenoid fossa (shoulder socket). It is considered instability when the head of the humerus partially or completely dislocates from the socket repetitively. 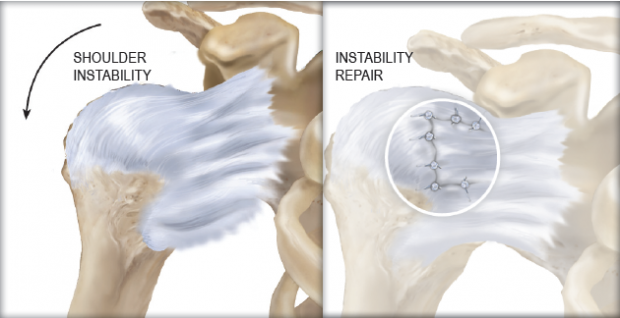 Most people who suffer from symptomatic shoulder instability would complain of shoulder pain. They can also feel shoulder looseness, or “popping” or “clicking” of the shoulders. There are also others who complain of numbness or weakness. It can be very painful and affect performance dramatically. These symptoms occur during normal activities, particularly those with overhead movements such as swimming and weight training, among others. Symptoms may also get worse over time. Some patients can attribute a precipitating event for these symptoms, however not all will be able to associate the injury with a prior event. instability. This occurs from tissues that are lax, usually from a congenital or acquired issue. The second type of instability results from a traumatic dislocation. 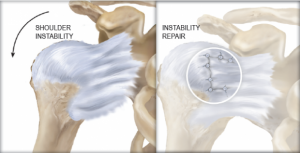 Often times, the resulting, soft tissue injury results in a very high chance of instability and subsequent dislocations. 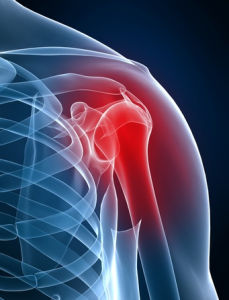 The treatment for symptomatic shoulder injury can be conservative or surgical. The nonsurgical option should always be considered first, but surgery is indicated for specific conditions. If the arm is dislocated from the shoulder socket, the immediate treatment is reduction, or putting the joint back into place. The shoulder should then be immobilized with a sling. Afterwards, cold compress should be applied to reduce swelling and inflammation. The patient should then see a top sports medicine doctor for a complete history and physical examination. Immobilization for dislocated joints may require three to eight weeks to heal completely. This should not entail complete immobilization, since a frozen shoulder can result. The goal of non-surgical therapy is to improve the stability of the joint by strengthening the muscles of the shoulder. 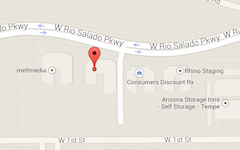 This is accomplished through a progressive program of physical therapy and rehabilitation. Rehabilitation is key to retraining the shoulder to perform movements at a more stable range. Physical therapy focuses on neuromuscular training, strengthening the compressor muscles, and improving shoulder stability. Surgical operations can be done through arthroscopic or open surgery. Arthroscopic surgery is preferred because it requires smaller incisions and is shown to have faster healing times compared to open surgery. Open surgery may be required, however, for large tears and injuries requiring direct visualization and repair.